The most wonderful time of the year returns to the Happiest Place on Earth with Holidays at the Disneyland Resort, November 10 through January 8! The festive season will bring jolly new experiences plus returning festive favorites. At Disney California Adventure park is the all-new nighttime spectacular, “World of Color – Season of Light,” celebrating the warm and heartfelt spirit of the holidays. “World of Color – Season of Light” will take guests through a sparkling winter fantasy, combining classic holiday songs with memorable moments from treasured Disney animated films to create an experience filled with magic. Also new for 2016, the Festival of Holidays invites guests to celebrate the season like never before at Disney California Adventure park. 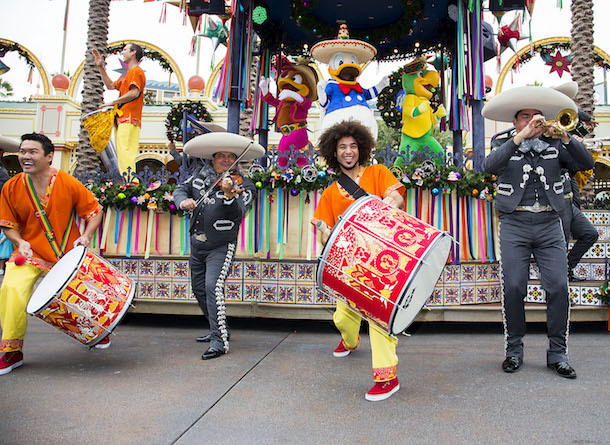 The entire family will delight in diverse cultural holiday celebrations, including the popular Disney ¡Viva Navidad!, and the global sounds of special guest musical groups will ring throughout the festival. Guests will enjoy delicious, internationally inspired food and beverage at 14 themed festival marketplaces, and the young and young-at-heart will celebrate with some of their favorite Disney Characters. Princess Elena of Avalor will make her Disneyland Resort debut during Festival of Holidays, and after Holidays at the Disneyland Resort conclude January 8, she will remain at Disney California Adventure park to continue visiting with guests. Over at Disneyland park, the holiday season brings the return of fan favorites including the popular Sleeping Beauty’s Winter Castle, featuring magical snowfall moments that conclude with “Believe … in Holiday Magic” fireworks. Also returning for Holidays at the Disneyland Resort this year will be “A Christmas Fantasy” parade, “it’s a small world” Holiday and Haunted Mansion Holiday. Looking for Santa Claus? He and his sleigh full of mischievous elves will visit Redwood Creek Challenge Trail for this holiday season, where guests will join the festive fun with a series of holiday-themed activities along the trail. And when Santa visits Disneyland park, guests will be able to find him in a special location in Critter Country. With the dazzling Disneyland Resort Diamond Celebration coming to a close on September 5, Disneyland has announced that this fall will see the return of two favorite nighttime spectaculars. At Disney California Adventure park, the original version of “World of Color” will be presented, beginning September 6th, with all the great sequences of Disney animation and music you remember, from WALL-E and Eve zipping through the cosmos to Pocahontas exploring just around the riverbend. Across the Esplanade at Disneyland park, you’ll once again be able to enjoy the timeless soundtrack of Disney’s “Fantasy in the Sky” fireworks spectacular when it lights up the sky over Sleeping Beauty Castle Friday through Sunday evenings starting September 9th. 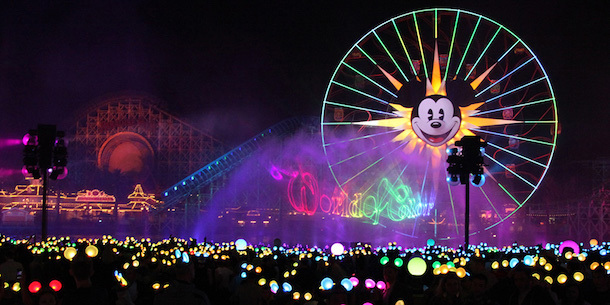 Versions of “Fantasy in the Sky” date back to 1958, when Walt Disney envisioned the show as a spectacular “kiss goodnight” for his Disneyland guests. “World of Color” and “Fantasy in the Sky” will each be presented through the early November kickoff of Holidays at the Disneyland Resort. So go ahead and plan your visit, and get your nostalgia on! Relax at seated high-top tables while you enjoy a sweet and savory selection of desserts, elegantly plated on china. Desserts include a Dulce de Leche-filled cookie, Mickey Coconut WMacaroon, a selection of fruit and artisanal cheese, just to name a few. Adults can indulge in sparkling wine, and sparkling cider will be available for guests under 21 years of age. Cost is $79 per person, tax and gratuity included. Reservations are highly recommended, and are now open for dates beginning March 17. Make yours by visiting Disneyland.com/dine or calling 714-781-DINE. Holidays at the Disneyland Resort begins November 13th, and today Disneyland is sharing the details on what this dazzling holiday season will bring to Disneyland park, Disney California Adventure park and the Downtown Disney District. At Disneyland park, “A Christmas Fantasy” parade returns, showing daily along with the new “Paint the Night” parade each night. “Mickey’s Soundsational Parade” will return in January after the holiday season ends. Each night, the all-new “Disneyland Forever” fireworks spectacular will light up the park as we continue the Disneyland Resort Diamond Celebration; “Believe … in Holiday Magic” fireworks will not be presented this year. Be sure to check the calendar page of Disneyland.com for details on daily times for all shows and spectaculars. Also at Disneyland park, Santa Claus will greet guests at a new location in Critter Country. When he visits Disney California Adventure park, Santa can be found at Elias & Co. on Buena Vista Street. Don’t miss your chance to experience the magic of the all-new “World of Color – Celebrate!” during the 24-Hour Disneyland Resort Diamond Celebration kickoff event, May 22-23! Additional “World of Color” dining packageshave been added for the event at select restaurants at Disney California Adventure park. “World of Color” lunch and dinner packages with reserved viewing for the 9 p.m. and 10:15 p.m. shows on May 22 are available at Carthay Circle Restaurant and Golden Vine Winery and will feature regular menu items. For reservations, visit Disneyland.com/dine or call 714-781-DINE. 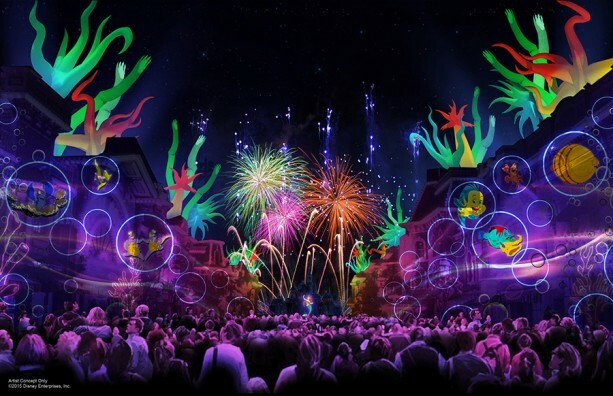 Learn more about the all-new “World of Color – Celebrate!” coming for the Disneyland Resort Diamond Celebration, featuring hosts Neil Patrick Harris and Mickey Mouse, in this article by my fellow author, Shawn Slater. Keep checking the Disney Parks Blog – soon I will be sharing a full listing of specialty food and beverage items for the 24-Hour Disneyland Resort Diamond Celebration kickoff event! 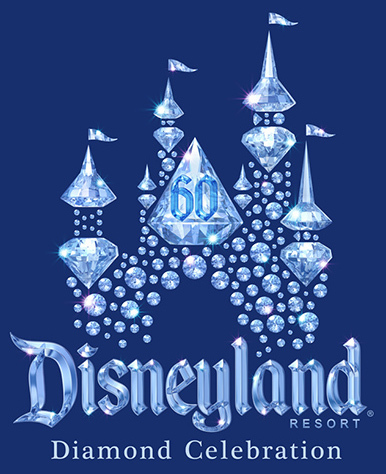 Tonight, during a special after-hours presentation on Main Street, U.S.A., at Disneyland park, Tom Staggs, Chairman, Walt Disney Parks and Resorts, announced that the Disneyland Resort Diamond Celebration marking the resort’s 60th anniversary, will begin Friday, May 22. As part of the celebration, the iconic Sleeping Beauty Castle in Disneyland park and Carthay Circle Theatre in Disney California Adventure park will glisten and gleam, each with its own diamond medallion featuring the letter “D.” The entire resort will sparkle with Disneyland Resort Diamond Celebration décor and festive banners in shades of Disneyland blue. Also bearing the diamond anniversary theme, creative merchandise and food items will be designed to complement the celebration. We’ll have more to share on those special items soon. “As time has shown, Disneyland marked the beginning of something bigger than anyone could have imagined and this Diamond Celebration embraces its rich history while honoring Walt Disney’s commitment to pushing boundaries to create exciting and innovative new experiences for our guests,” said Staggs. Continuing a tradition of innovative, immersive storytelling begun when Walt Disney opened Disneyland on July 17, 1955, the Disneyland Resort Diamond Celebration showcases three electrifying new shows that will take you into the worlds of Disney stories like never before. Tonight, Tom Staggs was joined on stage by Steve Davison, executive for parades and spectaculars with Walt Disney Imagineering Creative Entertainment, as they shared that during the Disneyland Resort Diamond Celebration, Disney California Adventure park will present a special edition of the popular “World of Color” show. Opening May 22, 2015, “World of Color – Celebrate! The Wonderful World of Walt Disney” illuminates the night in a contemporary and moving celebration of Walt and his dream of Disneyland, showing that anything is possible if we never give up on our dreams. Mickey Mouse will take guests on a fun-filled and inspirational journey through the unparalleled imagination of Walt Disney, exploring his decades-long legacy of memorable animated moments and the dream of Disneyland park. 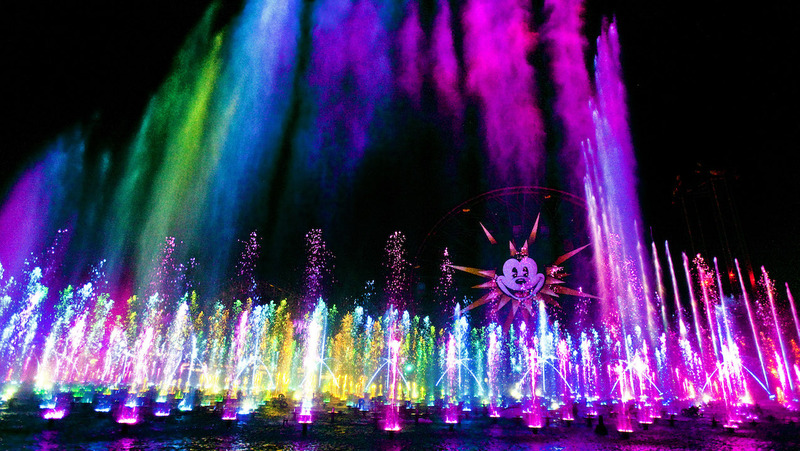 Both epic and intimate in scope, “World of Color – Celebrate! The Wonderful World of Walt Disney” brings to life the remarkable story of Walt and the Happiest Place on Earth in a first-of-its-kind spectacular, presented on the magic canvas of “World of Color” with compelling animated imagery, live-action footage, fountains, lasers, special effects and a stirring musical score. For Disney’s next big entertainment unveiling of the evening, Tom Staggs and Steve Davison shared that they’ll soon be painting the night in fantastic new light with one of the brightest gems of the Disneyland Resort Diamond Celebration, the “Paint the Night” parade. 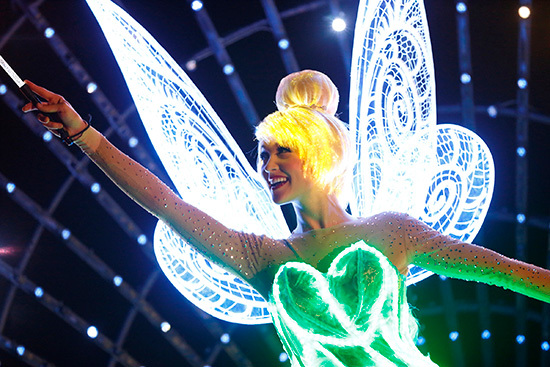 The “Paint the Night” parade brings some of the most innovative floats, vibrant costumes, dazzling special effects, unforgettable music and energetic performances ever presented at Disneyland Resort. This new, state-of-the-art nighttime parade floods Main Street, U.S.A., with stunning color, fun surprises and more than 1.5 million brilliant LED lights. Mickey Mouse uses his vivid imagination to harness the power of Tinker Bell’s pixie dust and “Paint the Night” in Disney dreams, bringing to light beloved characters and stories from “Monsters, Inc.,” “Cars,” “The Little Mermaid,” “Beauty and the Beast,” “Toy Story,” “Frozen” and more. Wrapping up tonight’s big entertainment news for the Disneyland Resort Diamond Celebration, Tom Staggs and Steve Davison have revealed a completely new kind of fireworks spectacular for Disneyland park, also debuting May 22, 2015. “Disneyland Forever” shows just how magical the Magic Kingdom can be, in a sky-high celebration featuring sparkling pyrotechnics, immersive projections, and other effects that transform Disneyland park right before your eyes! “Disneyland Forever” also features two original songs, the theme “Live the Magic” and the inspiring closing song “Kiss Goodnight,” written by Disney Legend Richard Sherman. Walt Disney once said, “Disneyland will never be completed, as long as there is imagination left in the world.” As “Disneyland Forever” caps off each evening of this once-in-a-lifetime celebration, we discover Walt’s inspiring words still hold true today. Disneyland will continue to be home to all our dreams and adventures … forever! Tonight, we’ve announced the Disneyland Resort Diamond Celebration will include a special edition of the popular “World of Color” at Disney California Adventure park, plus an impressive new nighttime parade and a fully-immersive fireworks spectacular at Disneyland park. Disneyland Resort guests are invited to show their patriotic Disney Side this summer to celebrate America’s birthday. Guests will celebrate the holiday with a special fireworks show, “Disney’s Celebrate America! A Fourth of July Concert in the Sky.” This stunning pyrotechnic production salutes the pioneering spirit and enduring beauty of America. 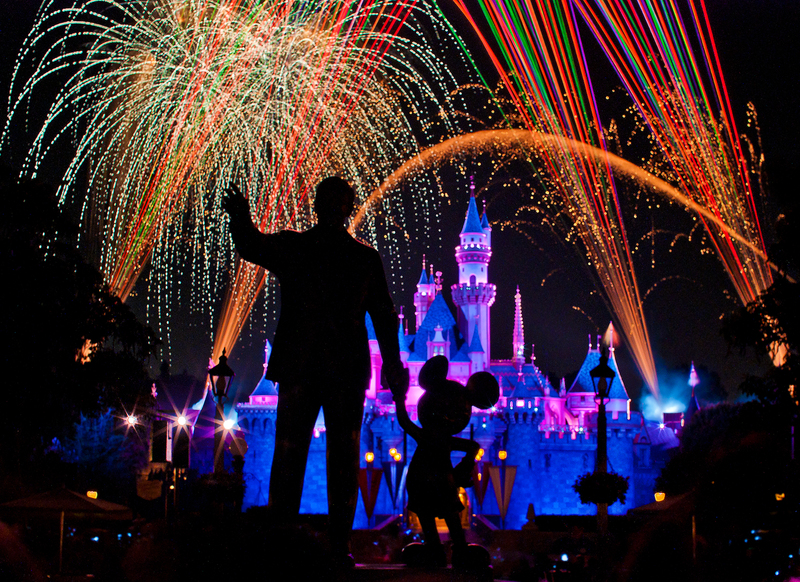 On July 1-4 at 9:25 p.m., the skies above Sleeping Beauty Castle will light up with a colorful display of fireworks, choreographed to a striking musical score that celebrates the best of America. In addition to “Celebrate America!” the 3rd Marine Aircraft Wing Band is returning to Disneyland Park and will perform several times throughout the day on Friday, July 4. The band will perform along the parade route at 3:30 p.m., just before the “Frozen” pre-parade and the first performance of Mickey’s Soundsational Parade. 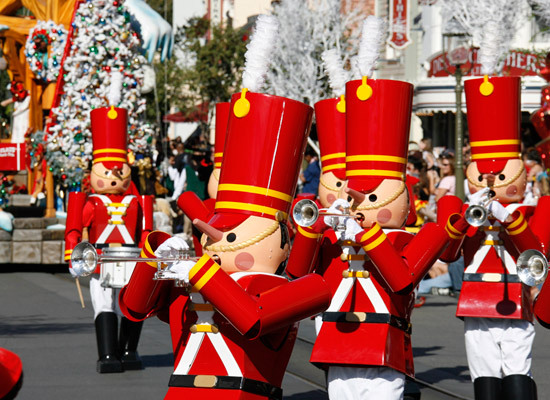 The band also will appear in Town Square at 5:30 p.m. during the Disneyland Park flag retreat ceremony, as well as along the parade route back to “it’s a small world” at 5:45 p.m. Finally, guests can see the full band in concert at Big Thunder Ranch Jamboree on stage, starting at 7:15 p.m.
Also on July 4, the water spectacular “World of Color” features a special, patriotic pre-show, prior to the 9 p.m. and 10:15 p.m. performances. Guests can “Glow with the Show” with special interactive Ear Hats that become part of “World of Color” at Disney California Adventure, and part of the “Celebrate America!” fireworks spectacular at Disneyland. Guests may also explore their patriotic Disney Side by visiting the inspirational Great Moments with Mr. Lincoln attraction on Main Street, U.S.A., or by attending the flag retreat ceremony, held in the early evening each day at Town Square in Disneyland. Additionally, the patriotic super hero Captain America greets guests daily from 11 a.m. to 6 p.m. at Innoventions.